Ancient giant crocodilians killed dinosaur prey by spinning their bodies in "death rolls," tearing off the beasts' flesh and limbs, researchers say. These new findings shed light on the way ancient reptiles interacted with their environments, scientists added. Bite marks found on fossils suggest that Deinosuchus preyed on dinosaurs such as hadrosaurs, which were large duck-billed dinosaurs, and medium-size bipedal dinosaurs known as theropods, a group that includes Tyrannosaurus rex and the ancestors of birds. Scientists have suggested that Sarcosuchus might also have fed on large dinosaurs, while Purussaurus hunted large mammals such as giant rodents, as well as turtles and fish. Researchers suggested that like modern crocodilians, these ancient reptiles might have used death rolls to finish off their prey. This lethal move involves reptiles holding their prey tight with their mighty jaws and spinning their entire bodies to rip off flesh or tear off limbs. However, the death roll can generate substantial forces in the skull. 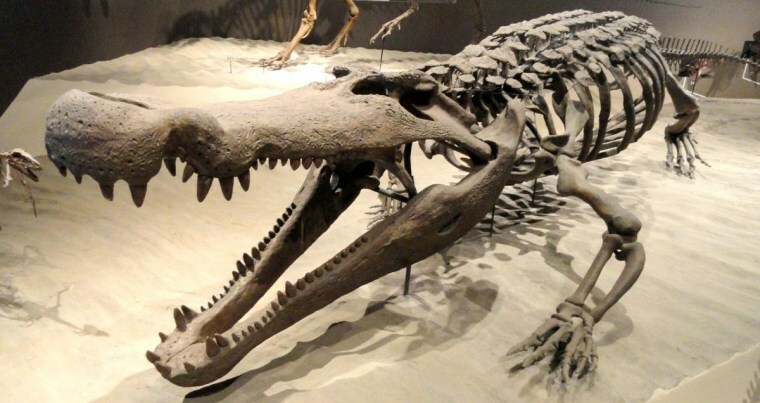 To see if ancient crocs had skulls that were strong enough to withstand these stresses, investigators modeled the skulls of 16 living crocodilian species and three extinct crocodilian groups. The researchers suggest that Deinosuchus and Purussaurus could execute death rolls on, respectively, dinosaurs and large mammals. However, narrow-snouted Sarcosuchus probably could not, as the forces to its skull may have been too great. The scientists found that death rolls were easier for smaller predators, because they were lighter, making it easier for them to spin. This means it was probably easier for juveniles than adults, said lead study author Ernesto Blanco, a paleobiomechanicist at the Institute of Physics in Montevideo, Uruguay. "It is possible that very large specimens use other approaches for taking chunks of meat from large vertebrates," Blanco said -- for example, with sideways movements of the head. They may have also simply swallowed small prey whole. The researchers did note their model had several uncertainties, as "we are studying much larger crocs than any living species," Blanco told Live Science. This means "we cannot completely exclude 'death roll' in Sarcosuchus." The scientists detailed their findings online April 16 in the journal Historical Biology. Follow Live Science on Twitter, Facebook & Google+. Original article on Live Science.